The Piper PA-18-150 Super Cub is a two-seat high-wing light utility aircraft. The Piper PA-18 Super Cub flew for the first time in 1949, and the FAA Type certification was awarded on 18 November 1949. The first production Super Cubs were delivered in 1949. Over 10.000 Super Cubs were built, including about 8,500 civilian Super Cubs and more than 1,800 delivered to the U.S. and several foreign military services as L-18Cs and L-21s for liaison; training; transport and target tugs work. Most of the Super Cubs were built until 1981 when production originally ceased. Super Cub production resumed by WTA between 1982 and 1988 totalled 250. Between 1988 and 1994 Piper Aircraft built another 102. The 1956-built Piper PA-18-150 Super Cub c/n 18-5121 was registered N6994B in the USA. On 14 July 1960, the aircraft was registered PH-TOM in the Netherlands with M.J. van der Meulen-van Tienen, Den Haag. The Super Cub was operated as a cropsprayer by Vliegbedrijf Tom van der Meulen out of Oostwold (Oldambt). As the other aircraft of Tom van der Meulen, the Super Cub was over the years wellknown with its signature 'tom vliegt voor U'. As the company of Tom van der Meulen moved to Oostwold in 1960, the registered ownership of the aircraft by M.J. van der Meulen-Tienen moved from Den Haag via Winschoten to Oostwold too. On 20 April 1992, the CofA of the aircraft expired. On 30 Novenmber 1995, registration PH-TOM was cancelled and the aircraft was stored at Lelystad Airport. The aircraft rebuilt and painted in its original 1960' 'tom vliegt voor U' colors. On 4 February 2013, the Super Cub was restored to the Dutch civil-register as PH-TOM with Vliegbedrijf Tom van der Meulen BV, Oostwold Scheemda. 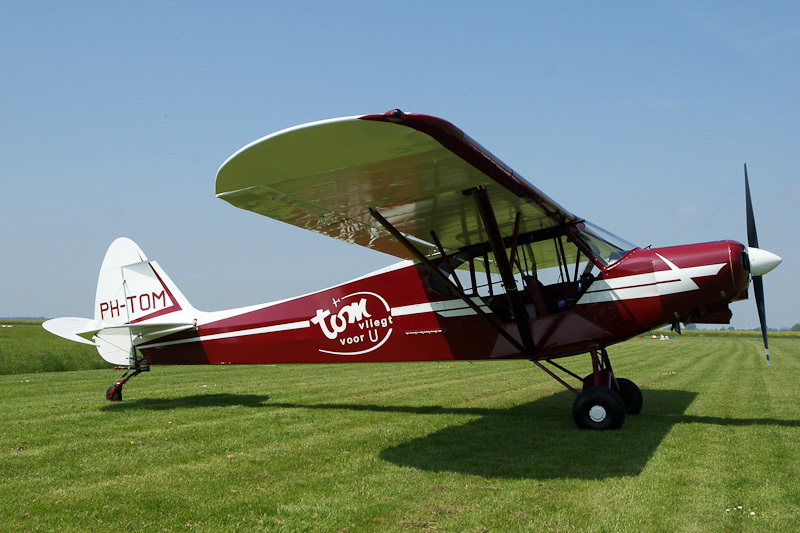 On 18 May 2014, Piper PA-18-150 Super Cub PH-TOM was seen at Oostwold Airport.